Wins/Snubs: Best Picture, Best Supporting Actor (Schildkraut), Best Screenplay. Paul Muni won the previous year, and Spencer Tracy took it for Captains Courageous this year instead. But Muni has one of the highest nominations/movie ratio of all actors. I honestly didn't know this story - though I knew the name of Emile Zola, I'll admit I didn't know why. Now I do - which is one of the best parts of this series of 30 Days of Oscar. Another entry in the "wow, they did THAT story back then." This is just before World War II, and the story centers on a Jewish Captain, Dreyfus, in the French military who is accused of selling secrets to the Germans. He is innocent, but even when presented with evidence, the higher ups won't back down. 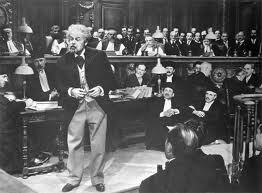 Zola finds out and publishes an article, J'accuse (I accuse you), in the newspaper attempting to get arrested for libel so they'll have to reopen the Dreyfus case. He stood up against anti-semitism before it was something everyone was required to do. Oh yeah, and he was a really famous writer first. At first, I didn't care for this - Muni was over the top as a young Zola, sharing an apartment with a young Cezanne. Then he write his first big novel, slightly scandalous, and is a huge hit, with lots of very big books to follow, and he can marry his sweetheart now that he has money. But by the time he's the big shot who is trying to be convinced to help Dreyfus, you've been sucked into his story and you actually care about Zola and whether he'll be ruined by using all of his celebrity to attempt to write a wrong. Of course this is all based on a true story, so it's easy to figure out he'll be right. This movie was made less than a year after the REAL Dreyfus passed away at a ripe old age. Overall, I enjoyed the film, but it's a good example of how not to make a biopic - don't bother with the whole life.